My wife and I have always wanted to get a popup camper... I wonder if this would qualify? 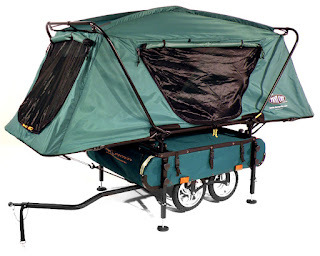 It doesn't come cheap though, at $899(usd) for the trailer, and an extra $219(usd) for the tent riding on top of it. I have no idea on the build quality of this thing, but I must say I am very impressed with the overall idea.